Spring break signals the coming end of the school year as well as time off from classes. Not every family has the resources to fly away for a mini-vacay, so I wanted to find a top-notch read for the teen reader. My choice? 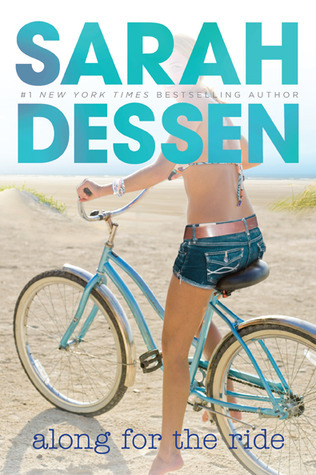 New York Times bestselling author Sarah Dessen's Along for the Ride. When eighteen-year-old Auden West graduated from high school, she planned to spend her summer before college at the beach, visiting her father and his new wife, parents of a newborn baby girl. It would give her a break from her beautiful-but-brittle mother who was an academic powerhouse. Auden thought the summer would give her time to start reading her freshman coursework textbooks so that she could hit the ground running when college started in the fall. In her opinion, she had adapted rather well to her parents' divorce. Her brother Hollis had consumed their mother's attention from birth, leaving Auden to bury herself in classwork, hoping to earn her parents' approval with her intellectual successes. Despite everything, she still felt ignored. Along the way, she neglected to develop friends and a social life. When she finally decided to at least attend her senior prom, her date cancelled at the last minute. When she arrives at her dad's beach house, she finds her new stepmother, Heidi, exhausted by the irritable baby and her father practically living in his office, working on a new book and leaving his wife to handle everything else. To escape the tension, Auden offers to help Heidi with the bookkeeping at her beach boutique. As she slowly gets to know the other girls who work at the store, Auden finds they are everything she is not...interested in fashion, boys and all things girl. Through them, she meets a group of local boys from a nearby bike shop, including the elusive Eli who has withdrawn from the social scene since the death of his best friend. Both Eli and Auden have difficulty sleeping at night, so they slowly begin to spend that time at the places Eli fills his nights with. When Auden confesses her lack of social experiences, including such basics as learning to ride a bicycle, Eli decides to take her on a quest to experience as many of the things she has missed as possible. As multiple aspects of Auden's life begin to slowly unravel, Dessen uses the act of learning to ride a bike as a metaphor for the journey to emotional maturity, "propelling yourself forward, into whatever lies ahead, one turn of the wheel at a time".